Five years ago, your editor reported on ionic thrusters, several of which were being tested by Barrett, associate professor of aeronautics and astronautics. These little devices have great promise for moving vehicles in space, where the vacuum presents no aerodynamic drag to overcome. Even a small nudge from a thruster in space will cause a vehicle to accelerate. 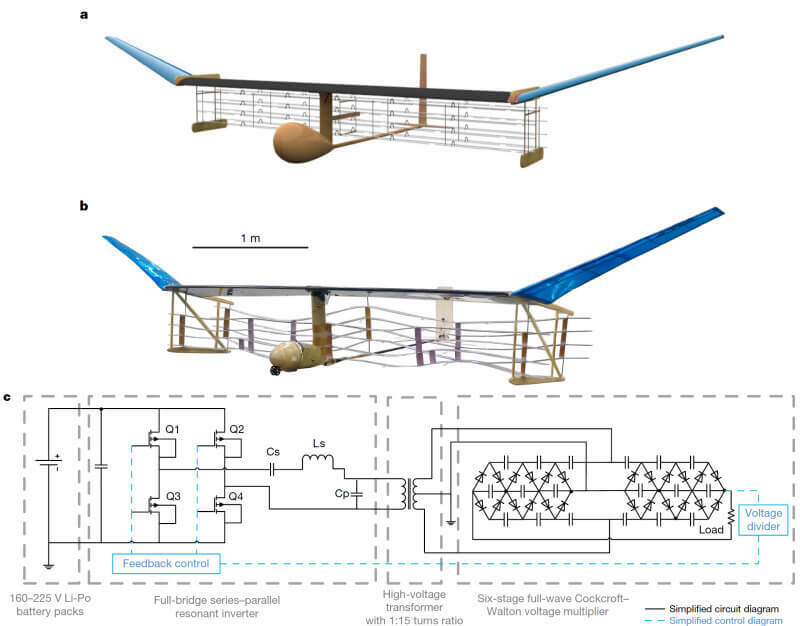 They work fine for low-speed propulsion of small balloons here on earth, or for lightweight lifters as part of science demonstrations, but have been neglected for heavier-than-air craft until now. Unlike the Wrights’ aircraft, and every other one since, Barret’s plane does not rely on propellers or turbines to move it through the air. 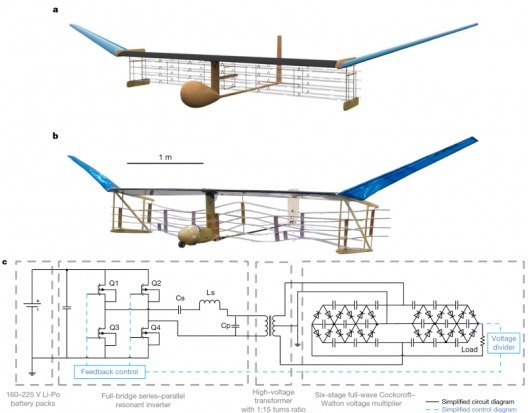 Instead, it is powered by a flow of ions produced aboard the airplane, which generate enough thrust to propel the plane over a sustained, steady flight. The craft’s 40,000 Volts supplied across the leading edge wires gives one pause, though. In a 2015 Cycle World Interview, Zero Motorcycle Chief Technical Officer Abe Askenazi said his company limited voltage on its battery packs to 102 Volts for operator safety. Perhaps, for the same safety concerns, many manufacturers are developing 48-Volt mild hybrid drive trains. The battery “stack” in Barret’s ion plane has its voltage electronically transformed to the 40,000 Volts necessary for forward motion. Professor David Perreault of the Power Electronics Research Group in the Research Laboratory of Electronics designed a power supply that increases low-voltage battery power to high-voltage wire power. The team, which included Barret and Lincoln Laboratory staff members Thomas Sebastian and Mark Woolston, made ten flights of 60 meters, limited by the size of MIT’s duPont Athletic Center gymnasium – which accounts for the basketball games in the background of some scenes in the video. The MIT announcement gives a description of the action that propels Barret’s plane. “Once the wires are energized, they act to attract and strip away negatively charged electrons from the surrounding air molecules, like a giant magnet attracting iron filings. The air molecules that are left behind are newly ionized, and are in turn attracted to the negatively charged electrodes at the back of the plane. In the near future, he sees such propulsion systems powering small drones, certainly less buzzy than even the electric ones. Farther out, “he envisions ion propulsion paired with more conventional combustion systems to create more fuel-efficient, hybrid passenger planes and other large aircraft.” Certainly, the idea of a delivery drone silently dropping off The Times or a pint of yogurt would save many sleepless mornings for many of us. *This was reported so widely and effectively that no fewer than four readers sent links. Thank you, all.